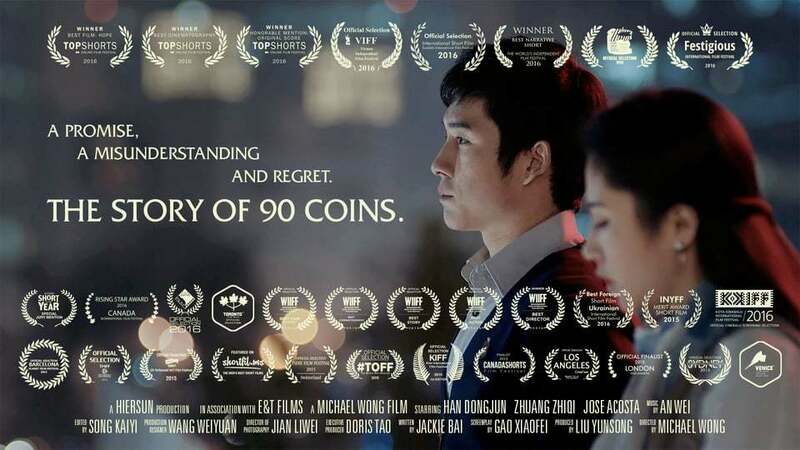 The Story of 90 Coins is a beautiful little film, marking the directorial debut of Malaysian film-maker Michael Wong. He tells me it is inspired by a true story, which just adds to its appeal – with a running time just over nine minutes and with only three characters, it’s a simple, engaging, and captivating film about a promise, a misunderstanding, and regret. Michael, who took the trouble to contact me, having found the Piece of Pink Pie blog, is based in Beijing, and made the film in China, but it has received accolades from all around the world. Its many awards include the Best Direction & Best Cinematography at Malta International Short Film Festival, Best Foreign Short and Best Actress at Los Angeles Independent Film Festival Awards, Best Drama and Best Cinematography at Los Angeles Film Awards, Best Foreign Short Film at Ukrainian International Short Film Festival, Rising Star Awards at Canada International Film Festival, and an Official Finalist at London Film Awards. Michael is a former ad agency art director and creative director, who has worked in China since the ’90s, on campaigns for brands such as BMW, Johnson & Johnson, Mercedes-Benz, and Unilever. That commercial experience shows in 90 Coins – the people are beautiful, every shot is carefully crafted, and the story carries us on without much pause for breath. As one critic suggested, it achieves more in nine minutes than most Hollywood romances manage in a couple of hours. The Story of 90 Coins stars Han Donjun and Zhuang Zhiqi as the central couple, and you can watch the film on Vimeo here. I’m sure we’ll see much more from the talented Michael Wong. You may also be interested in these recent Piece of Pink Pie interviews with actresses Florence Cady and Mhairi Calvey. Tags: Beijing, BMW, Canada International Film Festival, China, Han Donjun, Hollywood, Johnson & Johnson, London Film Awards, Los Angeles Film Awards, Los Angeles Independent Film Festival Awards, Malaysia, Malta International Short Film Festival, Mercedes-Benz, Michael Wong, The Story of 90 Coins, Ukrainian International Short Film Festival, Unilever, Zhuang Zhiqi. Bookmark the permalink.